What makes a good summer stitching project? The answer to this will vary, undoubtedly, depending on what you like to do in the summer, the type of climate you live in, and whether you’re a “seasonal” stitcher. And of course, there’s the whole question of what you like to stitch, too! For me, a summer stitching project should have a few key attributes. I’ll share my ideas on those below, and then suggest some projects that would make a good fit for summer stitching. 1. It should be portable. I tend to go more places during the summer, whether it’s out of town or just visiting with friends and family locally. So I like a project that can be easily toted hither and yon, that I can put a few stitches in while waiting here or there or while just sitting around visiting. 2. It should be light. I don’t like heavy duty embroidery in the summer, set up on big hoops or frames with excess fabric or heavy threads. When temperatures soar, I like something light, easy to hold, comfortable – something that doesn’t smack too much of “warm and cozy,” because who wants warm and cozy when it’s 100 degrees out? 3. It should be relatively simple embroidery, something I can do right off the top of my head. If I’m toting it around, I don’t want to tote around lengthy instructions, reference books, or anything extra that I’d require for more complex techniques. In summer, simple is good! 4. It doesn’t hurt if the project sort of screams Summer! Although I don’t consider myself a “seasonal” stitcher – I don’t necessarily anticipate the seasons and stitch something particular for each season – I do like embroidery that reflects different seasonal changes, whether it’s in the type of project or in the color scheme or in the materials used. You just can’t go wrong with flour sack towels when it comes to portability. Playing around with Transfer-Eze (This is the same stuff, more or less, as Sticky Fabri-Solvy). You’ll find the conclusion of my experiment here. This stuff (and Sticky Fabri-Solvy) make stitching on a flour sack towel pretty simple! The Back of a Flour Sack Towel – just some general reflections on embroidering flour sack towels and what to be concerned about on the back. Gingham embroidery is So Much Fun! It’s light, it’s cheery, and you can use it to adorn all kinds of summery-related things, from your picnic supplies to your children’s garb to a bright and happy apron. You’ll find a list of gingham embroidery related articles right here, including a tutorial on “chicken scratch” and lots of patterns for unique designs. 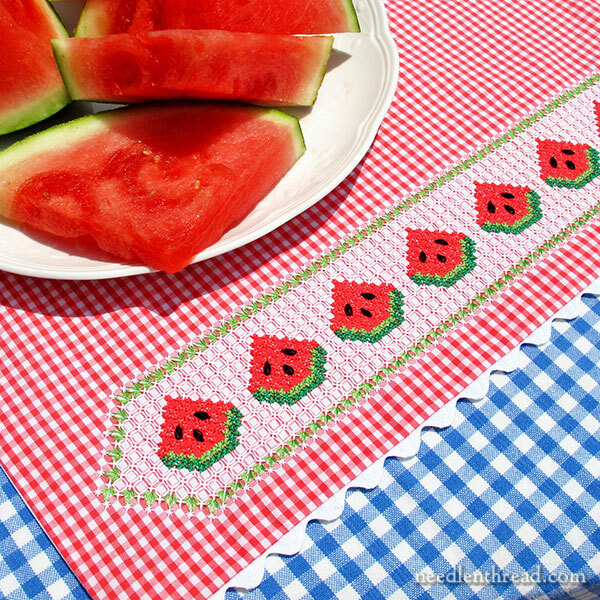 And you can’t miss this article on gingham embroidered watermelon, because it’s the kind of project that really screams Summer! 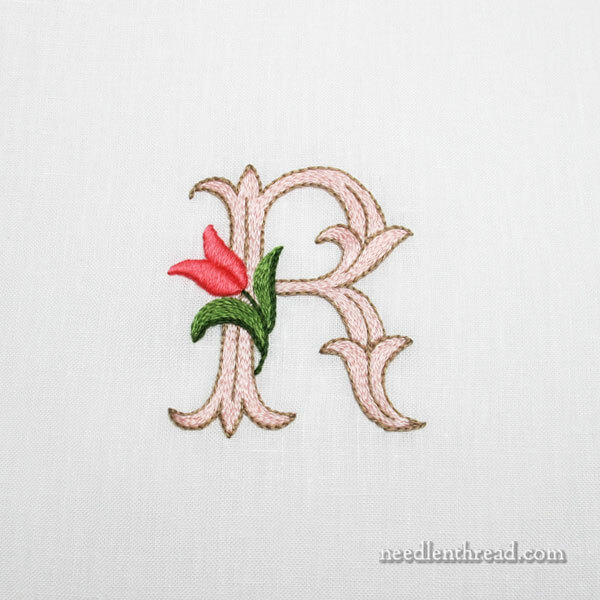 Decorative embroidered initials are generally small, they can be worked in a variety of techniques on small things, and they open up possibilities for all kinds of playing about with color, threads, stitches. You can find information on this little monogram above here. You might decide to monogram a pretty little linen towel, like this. You’ll find a list of helpful articles at the end of that post. You can also find a series of tutorials on monogramming another linen towel here. The links to subsequent articles in the series are at the end of the article. 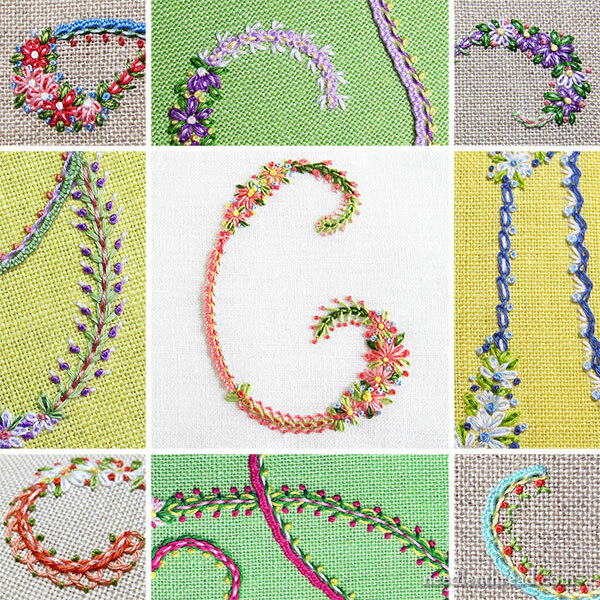 And then, of course, there’s the fun of the decorative initials that appear in my Stitch Sampler Alphabet e-book. Those were a blast to stitch and, because they mostly fit in a four inch hoop, they were easy to tote around. What type of stitching do you like to do in the summer time? Do you have any particular criteria when you’re setting up a project to while away those hot summer hours? I’d love to hear your take! 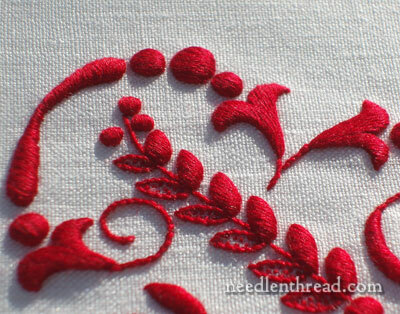 Feel free to join the conversation below and share your ideas with the stitching community here on Needle ‘n Thread! You never know who you might inspire! October 21, 2015 Fall Stitching, Anyone? HI Mary..love your blog/newsletter. Regarding your more recent query -I instinctively turn to lighter colors and out-right summer themed projects. But strangely enough, summer is when I start to knit and crochet, too, go figure. I would say that your judgment takes over to tell you it will take you until fall or winter to finish the crochet or knitting. Your inspiration, no matter how simple, is really what keeps me coming back again and again. Yes, portable it must be. I absolutely LOVE gingham lace! The watermelon design is beyond cute, Mary! Thanks for posting this topic! I loved the colors in this piece! I think it would totally work for summer too! Thot you’d be interested in these initials. I started the watermelons last year and “revived” them this winter, and I have to say, they really are fun to stitch and to look at! My fabric isn´t equally square (is it called “evenweave”? ), so they are okay on two sides and a little flat on the others, but I like them okay anyhow. When I read your article, I just HAD to stitch this pattern, and it got me to embroider far more than I thought I would like, so thank you once again for being an inspiration and great teacher! All my best wishes for your health and your upcoming plans, you are amazing! I wait eagerly for your newsletters….Such good ideas! Yes, light colors and transportable are good. BRIGHT and HAPPY colors are a must!! I live in the Pacific Northwest and it is raining here now. It is often gray, even in summer. I must make my own happiness so I love bright and happy colors to make me smile. For summer it is small projects to carry, often blackwork in color as Very few skeins are needed. If I am home it might be stump work as generally the parts are small. I hate being without a project or two, or three. I love the red on linen monogram. Is there any chance you might do some pdf’s of that alphabet? At the moment I am working on embroidered quilt blocks for my youngest granddaughter. She loves Tinker Bell. So I am doing different scenes from all the Tinker Bell movies. I like to stitch Christmas ornaments in the summer (and yes, flowers in the winter). We don’t have clearly defined seasons here in the Low Country, and it sure can get hot and humid. A little dose of frosty-looking stitching can be fun. LOVE your watermelons on gingham, Mary! 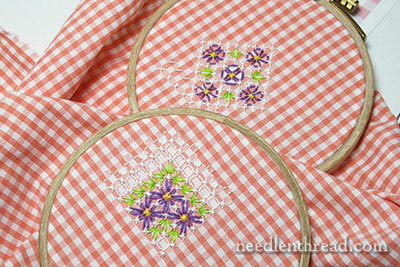 Gingham is so cheery & a great way to start teaching children to embroider. You’ll find Gingham Lace, Gingham Cross Stitch, snowflaking, needle weaving and more! I’m on a bit of an unplanned stitching hiatus right now… maybe I sort of overwhelmed myself with the complexity of a certain WIP of mine and subconsciously decided that I needed a break from my embroidery? Thanks for the many informative chats! Bless you for sharing your skills with us. Did I say here in “Teas”? That should read “Texas”. At least the typo gives you an idea of my sewing “skills”…kinda like I type. I am obsessed with hand embroidery and search “any site” for inspiration, I am trying to master thread painting and my goal would be to do a portrait of my grandson, but not quite there……currently doing small pieces to make into a quilt. The fabric is magnificent Belgium linen which is a joy to stitch on, no theme but mostly floral. Aspire to be as expert and neat as you Mary. My problem is keeping the fabric drum tight in the hoop. 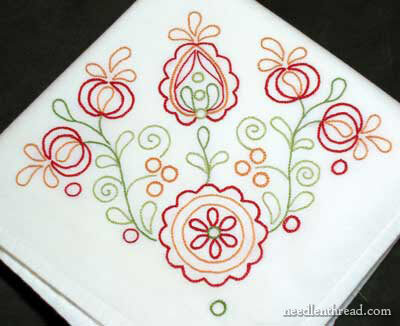 Where is the pattern to the floral design above the part about dishtowels? It looks like a great summer project all in chain stitch? Hi, Susan – that design was from a Burda booklet that someone gave me, so it’s not available here on the website. The booklet was from the 70’s, I think? I’m just new to receiving your news letter. I have been following with great interest your progress on Late Harvest. I started working on my kit last summer (it is winter in Tasmania at the moment) I am almost there. 4 more detached leaves to go. I have enjoyed it but had to adjust my thinking a few times as the method for working the detached items is very different to how I work them. I will be working on a bit of Kashubian embroidery through to next Summer so hopefully that will be another UFO complete. I have enjoyed reading everyone’s comments. Right now my crewel is languishing, because it’s too hot to work upstairs. So, I knocked out an apron using Farm and Fireside 4430 Economy Apron from Unsung Sewing Patterns. I decided to embroider the pockets and neckline with garden tools and flowers. Fun, quick, portable and so useful in the garden. Mary, I do hope you start feeling better. Thanks for the towel tip. I think I might try their huck towels. It is put out by a cottage industry out of Portland Oregon. This would be a great addition to someone who wants to have a nice summer sampler to work on. I found out about it through her blog Allison Paulson. I think it is a very cut and well done sampler. Just thought you would like to know. I’m a sucker for baby bibs. They are portable, i can stamp them, pick out the colors I need, put them in a zip-lock bag with a couple of needles, a snipper to cut the thread, everything in a tote and I’m ready to go. Hi Mary, I thought I’d share with you something a little different. My church has been sending mission teams to Cuba. They reported that the children have no toys. A few of us ladies have been making very simple teddy bears. For the faces, we have only needed the running stitch, back stitch and satin stitch. We also add a heart which says, in Spanish, “Jesus loves me.” We have been told that the bears bring great joy and big smiles to little faces. I have found hand sewing these bears very enjoyable and can take them wherever I go.